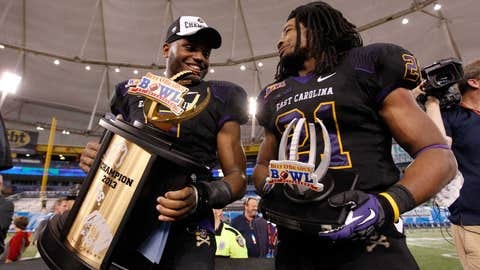 East Carolina Pirates wide receiver Cedric Thompson and running back Vintavious Cooper hold the trophy after they beat the Ohio Bobcats at the 2013 Beef O Bradys Bowl at Tropicana Field. ST. PETERSBURG, Fla. (AP) — Ten victories and East Carolina’s first bowl win in six years. The Pirates, who finished second in Conference USA’s Eastern Division, had plenty to celebrate after dominating the fourth quarter to earn a 37-20 victory over Ohio in the Beef ‘O’ Brady’s Bowl. "It was a great season, we had a lot of goals and although we fell short of a goal to be conference champion we made a lot of other things happen along the way," coach Ruffin McNeill said. "Our young men learned that having a great attitude and doing things the right way and putting teamwork first allowed us to accomplish great things." Vintavious Cooper took over Monday’s game with a performance reminiscent of a former East Carolina running back. Just don’t bring up that comparison to Cooper, who rushed for a career-best 198 yards and scored two touchdowns. In addition to breaking the Beef `O’ Brady’s Bowl record for yards rushing, the senior became the first East Carolina player to win a MVP award in a bowl game since Tennessee Titans star Chris Johnson ran for 223 yards against Boise State in the 2007 Hawaii Bowl. "It’s a great accomplishment and I have to really give it up to the guys up front and all the work they did. When I found out I was close to 100 yards after the first quarter I told them and they got excited about it," Cooper said. "I would never compare myself to Chris Johnson because I really admire CJ and I look up to CJ. He’s done so much for me. I’m just happy my name is next to his in any way." The Pirates (10-3) grabbed the lead for good on the first of Cooper’s two touchdowns runs in the fourth quarter, a 31-yard burst with just under 10 minutes remaining. East Carolina’s Shane Carden threw for 273 yards and one TD and also scored on a pass reception. "All season we’ve been about playing big in the fourth quarter and this was going to be a game that we needed to grind out and fight to win because Ohio is a real tough team that’s well coached," Carden said. Cam Worthy caught an early 5-yard scoring pass from Carden, and then took a lateral and threw 14 yards to Carden for a fourth-quarter TD that made it 31-20. Cooper put it well out of reach, finding an opening off left tackle and racing 22 yards for his second TD. Tyler Tettleton and Derrius Vick threw scoring passes for Ohio (7-6), which overcame an early two-touchdown deficit to lead 20-17 before Cooper put East Carolina back in front before an announced crowd of 20,053 at Tropicana Field. Breon Allen also scored on a 2-yard run for East Carolina, which won six of its final seven games to finish with the second-most victories in school history. Carden set the school record for single-season yards passing with a 13-yard throw to Isaiah Jones on the drive ended with Allen’s TD, making it 14-0. He completed 29 of 45 passes while boosting his season total to 4,139 yards, breaking Dominique Davis’ record total for the Pirates. Cooper ran for 90 yards in the opening quarter alone, becoming the third running back in East Carolina history to rush for 1,000 yards in consecutive seasons. Justin Hardy, meanwhile, had eight receptions for 59 yards, setting a school record for yards receiving in a season. He finished with nine catches, giving him 114 receptions for 1,284 yards. Ohio battled back after a slow start. Tettleton and Vick each threw a touchdown pass in a five-minute span to make it 14-all early in the second quarter. Tettleton got the Bobcats going with a 26-yard completion to Daz’ Patterson on a flea flicker, and then found Patterson for a 17-yard TD on the following play. Vick and Donte Foster combined for an 80-yard score on Ohio’s next offensive play for the longest scoring pass in Beef `O’ Brady’s Bowl history. "They’re a very, very physical football team on the defensive side, and very strong. Generally you’re not going to traditionally line up and just run the ball right at them and feel like you’re going to be successful," Ohio coach Frank Solich said. "We had to come up with ways that we felt we could continue to make plays and then hopefully have our fair share of big plays." Foster finished with six catches for 160 yards, earning most valuable player honors for Ohio. Tettleton was 21 of 40 for 228 yards, one touchdown and three interceptions. "A win would have made this a whole lot better," Foster said. "It would have made it very tremendous, but I felt like our guys played their hearts out."